Autism or Autism Spectrum Disorder is the wide arena of many complicated childhood disorder, causing mild to severe impairment in the normal brain development of the child. On a general note it is referred to as neurological disorder during the first three years of life with triad of restrictions in the mental abilities such as social interactions, social communication and repetitive behaviour or flexi thinking due to unprocessed sensory information. Thus, in short an Autistic child, is the child with the special needs that can be taken care of in a very special way! Initially, autism was thought to be a very rare disorder, identified occasionally in one to two children out of ten thousand live births. As per the CDC estimation, the prevalence of autistic cases in 1990’s was 1 in 2500 which later increased to 1 in 1000 and currently almost 1 kid out of 88 children is reported to be suffering from any of the different forms of ASD. It has as well been estimated that the reported cases of autism are almost five times more common among boys than in girls irrespective of all racial, ethnic and socioeconomic groups. Although with the increasing prevalence, it is still not clear as how the autism brain can be different from the typical brain! Although many theories have been put forth concluding that a single factor cannot be blamed for its occurrence, researchers have linked it up with various genetic and environmental problems. It has been observed that some children with hereditary genetic makeup are born susceptible to autism, whereas many other studies have indicated that certain factors like smoking, drug addiction, alcohol consumption, viral infection, metabolic imbalances, chemical exposure, allergies etc. during pregnancy can be responsible to cause abnormal structural brain development. Disinterested to be picked up, cuddled or to be touched. Impaired non verbal communication such as gestures, facial expressions and unusual reaction to sight, smell, toys or colors. Lack of concentration, self restriction. 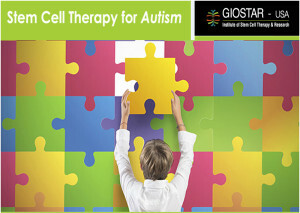 Although, till date there is no full proof cure available for autism, researchers all over the world are trying their level best to shed light on many unknown facets of ASD by combining the different approaches of molecular biology, cell biology, neurosciences. In the meantime, many children are relieved through the contemporary stem cell technology. What goes wrong in Autism! In general, it has been evidently acknowledged that the autism is caused by structural and thereafter functional abnormality of the brain. The brain is the pivotal organ in maintaining functional integrity of the body. This has been achieved in a very well and coordinated fashion through neurons, hormones as well as electrical impulses. When the scientists started studying autistic brain, they observed few basic differences than the normal brain such as; breakage in the electrical impulses passing the information from brain to other parts of the body, lack of distant connections with the brain and increased levels of two important hormones named as norepinephrine and dopamine playing prime function in social behaviour and communication. Studies so far have as well uplifted the fact that these factors act as important control knobs in regulating the intricate web of connections in the brain influencing the passage of faulty information from brain to different vital organs of the body causing Autism. Stem cells are the mother cells that are responsible for developing an entire human body from a tiny two celled embryo; due to their unlimited divisions and strong power to differentiate into all the cells of different lineage. This power of stem cells has been harnessed by the technology to isolate them outside the human body, concentrate in the clean environment and implant back. Once pushed inside the body again, these cells migrate at the site of injury due to their known paracrine effects and start secreting growth factors, cytokines and other factors required for creating a micro environment, suitable for their division. These cells can thus differentiate into required cells, regenerate damaged cells and help in resuming the function of the damaged organs under suitable conditions. Once infused back in the body, these cells can reach at the targeted site through their strong paracrine effects and differentiate into lost neurons or help revive the damaged ones to restore their function back. These stem cells have also observed to be promoting angiogenesis to increase oxygen supply to the blood for speedy recovery from Autism. Thus with our standardized, broad based and holistic approach, it is now possible to obtain noticeable improvements in the children with autism, in the symptoms as well as their functional abilities.